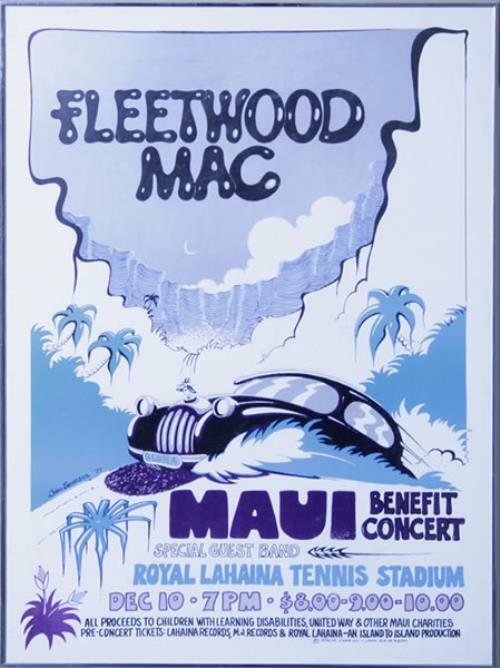 FLEETWOOD MAC Maui Benefit Concert (From the personal collection of John Courage, Fleetwood Mac's Tour Manager for more than a quarter of a Century, we have an incredibly rare original poster for a one-off charity concert that the band performed during a stop-off on their 1977 world tour, in aid of the Children With Learning Disabilities charity on Maui in Hawaii at the Royal Lahaina Tennis Stadium. This charity gig was presented to the band by John McVie who was living in Maui at the time. With artwork by John Severson, this impressive poster has to be about the rarest available for any Mac gig, believed to be one of just half a dozen, and it has been kept pristine, framed and glazed from new, in the collection of John Courage for the last thirty five years. Measuring 18" x 24", this is an incredibly rare item that is certain to be a focus for your home or office wall & will certainly be one of very few left in existence!). Tracklisting / Additional Info: This item comes direct from the personal archive of former tour manager, John Courage. Despite having connections with a UK national brewery of note, John decided that the Rock 'n' Roll lifestyle was more to his taste. In September 1972, he was poached from being the road manager of Savoy Brown to become the tour manager of Fleetwood Mac, just before the release of the 'Penguin' album & subsequent tour. Since that date until his retirement, he stuck with the Mac through thick & thin, seeing in the arrival of Lindsey Buckingham & Stevie Nicks to the band, creating a very new sound for the former Blues band. We are all aware of the effect that the 'Fleetwood Mac', then the mega-hit multi-platinum release 'Rumours' had on the band. The tours went from halls to stadiums in a couple of short jet propelled years. As the internal madness began to compete with the fan frenzy, John remained with the band through this incredible period, even though for one of his birthdays the band decorated his Hotel room with fifty chickens & bales of straw! Throughout these visions of excess, the music continued to flow as freely as the parties, resulting in sellout tours the world over. John found himself slowly acquiring a selection of items that were given to him by members of the band at various points over a distinguished career that lasted in excess of twenty five years. These gradually took up more & more space until, finally, John decided that some of them must go. What you are looking at here is one of those items. Its history is impeccable. Its provenance guaranteed. From the personal collection of John Courage, a one-off collectable from the tour manager of one of the biggest groups of all time.